Alicia García Herrero* | 2018 will be recalled as the year in which the US wake up to China’s economic power through a trade war. 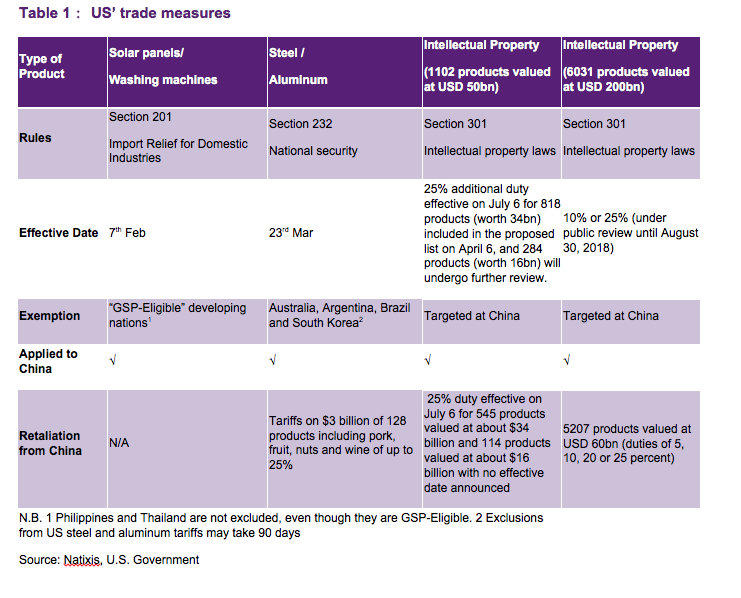 From seemingly untargeted measures announced in early February for solar panels and washing machines (See Table 1), the US has moved to increasingly targeted action against China. The most obvious case in point was the announcement of 25% additional import duties to be applied to USD 50 billion equivalents of imported goods from China on the basis of China’s infringement of intellectual property rights. More importantly, about two thirds of those import tariffs have been implemented since July 6. The US’ speedy introduction of the announced import tariffs, without allowing for much time to negotiate a deal between China and the US, shows that the US resolve to move away from the status quo in terms of the functioning of the global trading system, at least as China is concerned. On that basis, China had no choice but to retaliate with equivalent import tariffs on US goods. Since then, the list of Chinese imports that the US is aiming at increasing tariffs has expanded again to an additional USD 200 billion. Given China’s massive trade surplus with the US, its ability to retaliate is more limited, as it does not import enough good from the US to match the announced USD 200 in import tariffs from the US, which explains that China’s second batch of second retaliatory measures have been more moderate, at least in size (USD 60 billion). The market reaction so far seems to have been more negatively for China than the US, at least as far as the stock market is concerned (Chart 1), which has lost 18.7% year to date. 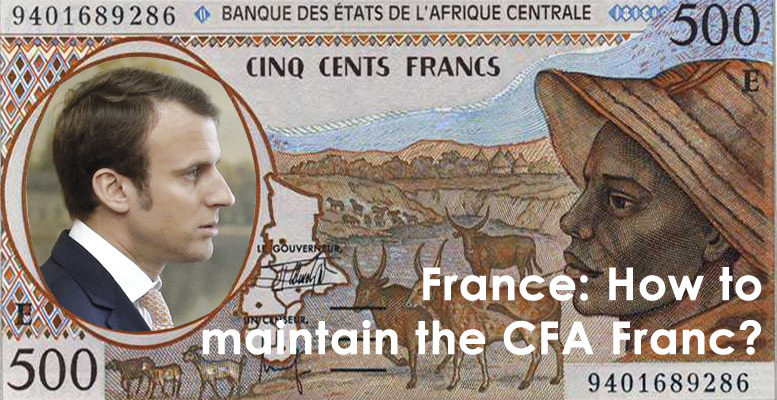 Furthermore, the RMB has depreciated 6.8% as of August 15, 2018. 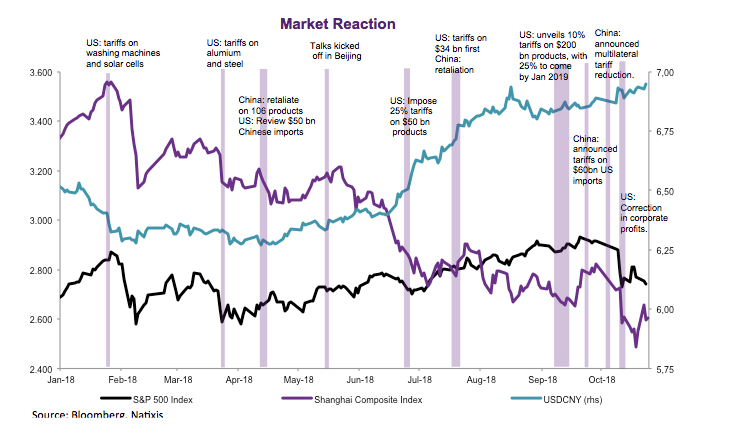 One may wonder whether the market is overreacting to the potential consequences of such trade war on China or, perhaps, underestimating the impact on the US. The analysis of the sectoral composition of the goods targeted by the US administration would support the view of relevant structural changes to happen in the global economy due to the trade war. In fact, out of the USD 50 billion in Chinese imports targeted by the US administration, more than 62% are high end and, in some cases, quite irrelevant to solve the problem that the US administration claims it is targeting, namely the reduction of the US-China current account deficit. In fact, two items in list have not yet even been exported by China into the US, such as aircraft and aerospace or arms and ammunition. 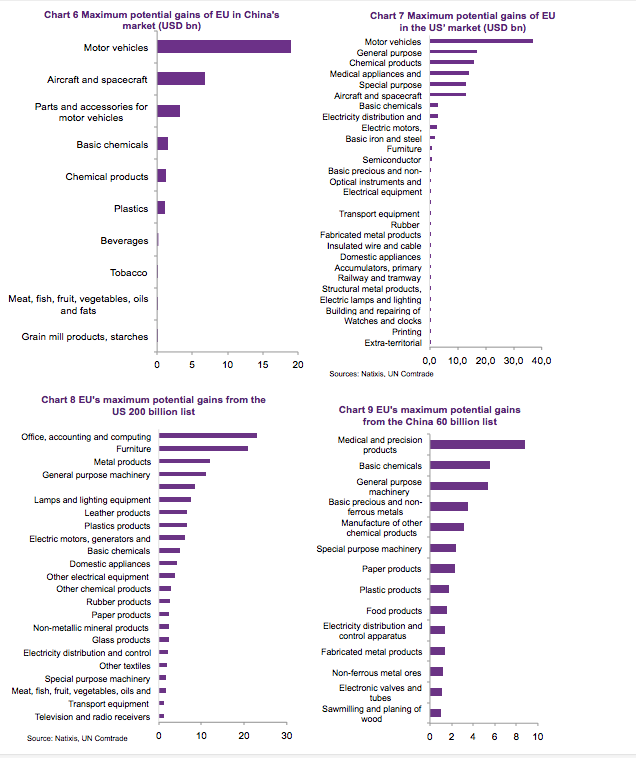 By including products that do not contribute at all to the US bilateral deficit with China, one could argue that the US is revealing its preferences, at least indirectly, which are to contain China in what it wants to become, namely a technological power that competes with the US in high end products (See Chart 2 below). Very interestingly, China appears to have realized quite quickly of the US intention as it has rapidly modified its own retaliation list from a more balanced one which included high-end imports from the US (including aircraft and aerospace) to one more focused on low-end products, such as agriculture (especially soy) and energy. Such a strategy makes sense in as far as imposing tariffs on high-end products, which China does not yet produce or cannot be sourced anywhere else would only hurt China. This is because it would only increase the price of products needed for China to achieve its ultimate objective, namely to move up the ladder of the value chain. US (or at least to a third country which is not China). This interpretation of the second round of tariffs could have tangible implications for third countries, which are now part of the value chain and have better economic relations with the US (even a free trade agreement which insulates them from increases in US import tariffs across the board). This is the case of Vietnam as well as Mexico (if NAFTA is finally renewed). For this second round of tariffs, China’s retaliation is much smaller with only 60 billion due to the limitation of the total volume China imports from the US. Yet, it is already a large bulk of the total retaliation list that China can further extend. In this round of retaliation, all low, medium and high technology stuffs are included which shows a determined stance that the Chinese authorities will not retreat from the US threat. The question to ask ourselves now is how this may affect Europe. 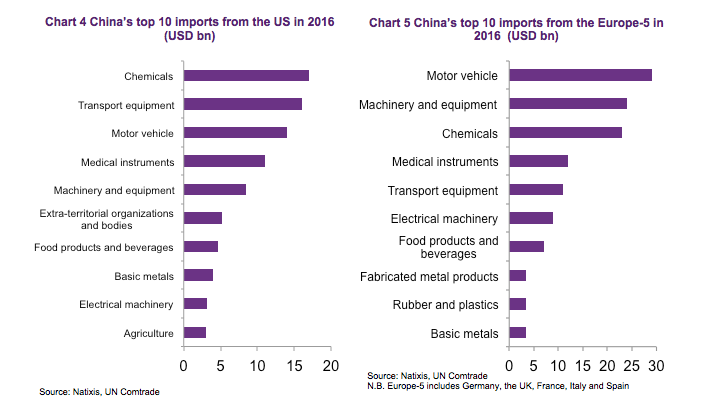 The first issue to realize is that European and US exports into China are very similar (Chart 4 and 5), which points to a potential substitution of American products in the Chinese market but also the other way around, namely substituting Chinese exports into the US by European ones. It goes without saying that, for Europe to reap such benefits, it would need to remain neutral in its trade policies and refrain from aligning from the US to impose tariffs on Chinese goods. 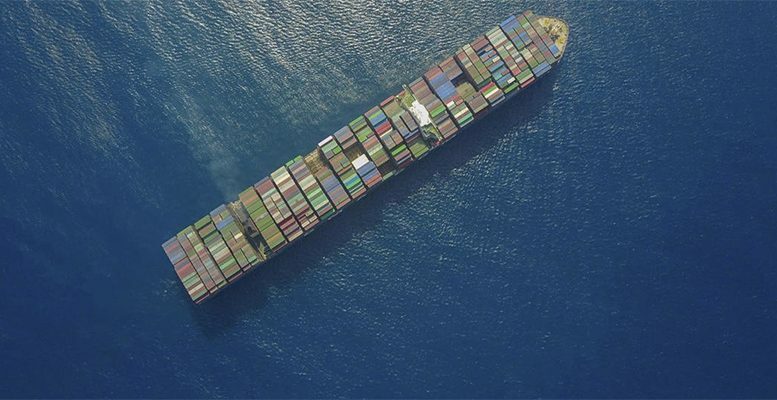 In such case, one could estimate the potential maximum gains of substituting Chinese exports into the US and the other way around in the sectors on which tariffs have been imposed upon. 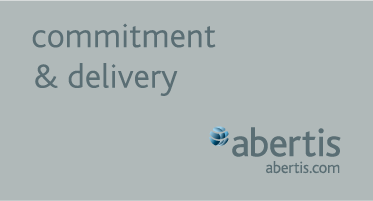 The end result is that some specific sectors can really benefit to the extent of nearly doubling their production for exports. This is especially the case of the automobile sector for the first USD 50 billion package of import tariffs imposed by the US (Chart 6 and). EU exporters clearly gain more from substituting Chinese exports into the US than the other way around. In other words, the EU dependence on the US goes well beyond the Atlantic Alliance and lands right on economic issues such as trade dependence. All in all, our analysis shows US-China trade frictions are here to stay in as far as they respond to a fight for hegemony in the global economy. The US wants to contain China’s future – which basically implies direct competition with Chinese products in third markets. In that regard, some countries may benefit from such a trade spat as they could substitute the two contenders into the other’s market. Europe, as the largest exporter in the world, should too, especially for some sectors such as automobiles. As for the second set of tariffs that the US has imposed on China, the focus is in low-end intermediate goods where the complementarities with EU exports are much more limited and, thus, also fewer gains to be made by European exporters. It seems important to remind the readers, though, that a good part of the gains to be made by European exports requires a neutral stance from the EU in the trade spat, which might be difficult if the US pushes Europe to support in containing China’s rise on the technological ladder. This is especially the case as the gains to be made by European exporters are larger in the US market than in that of China. In that regard, China may for once regret not having opened its market before, especially to Europe since it would have been easier to gather European support at this difficult time.